Greetings friends! I took a break from working on my ripple crochet blanket to do a quicker project - a Queen Anne's Lace scarf. I'm using a lovely yarn from Knitpicks, called Chroma, my color is Prism. I used worsted weight yarn and an F hook. Chain 6 and join into a ring. 1: Chain 3, work 13 dc into ring. DO NOT JOIN! Chain 1, turn. Work a sc into next 2 dc. *Chain 4, sc in next 2 dc. Repeat from * five more times (6 loops). Chain 6, turn. 2: Slip stitch into the 1st free ch4 loop. Chain 3,turn. Work 13 dc into the ch6 loop. Slip stitch into the the 1st sc of the 1st motif, chain 1, turn. Sc in next 2 dc. *Chain 4, sc in next 2 dc. Repeat from * five more times (6 loops). Chain 6, turn. 3: Slip stitch in 1st free ch4 loop of adjoining motif, chain 3, turn. Work 13 dc into ch6 loop. Slip stitch in next free ch4 loop of adjoining motif, chain 1, turn. Sc in next 2 dc. *Chain 4, sc in next 2 dc. Repeat from * five more times (6 loops). Slip stitch into next free ch4 loop of adjoining motif. Chain 6, turn. 4:Repeat step 3 for desired scarf length. End off and weave in ends. This pattern can be done with just about any yarn, but I wouldn’t recommend a boucle or textured yarn, as that would take away from the lacy effect. Last evening we met our youngest son, Travis, and his 2 and 3 year old boys for dinner. We ordered macaroni and cheese for the boys and I watched, transfixed, while they both ate each and every noodle until there were none left. Dayle picked one noodle up that Hayden dropped with a napkin and put it aside and Hayden insisted he give him back that one noodle. It was hilarious! When they were done I ordered them both a chocolate sundae. I will *never* forget the look of absolute *JOY* on the face of Caleb and how excited he was! 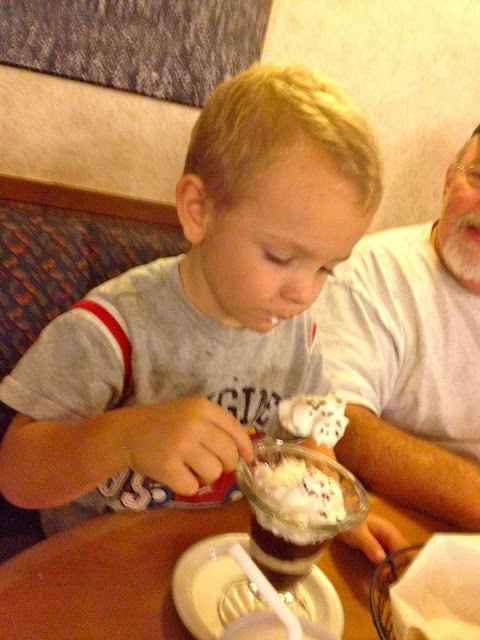 Here he is earnestly beginning his sundae. Last.. all of my Christmas cacti are blooming! This one is the white one that I got as a start from my dear Aunt Helyn in Annapolis, MD. She was married to my Dad's younger brother. She'd given me these starts when my sister and I visited her a few years ago and weeks later I found the bag and most of the cuttings were kinda "gone".. so I stuck the remaining cuttings in a pot out on the deck figuring nothing would happen. But it rooted and thrived. Christmas cactus is now one of my favorite plants due to it's ruggedness and beautiful blooms. If you don't have one, you might want to try one! I hope you enjoyed your visit today.. and thanks for the well wishes for hubby, he really enjoys getting to know my blog friends! We actually chat about you all and look forward to your blog posts. And for my readers who don't blog, we learn about you from your lovely comments. My flag counter tells me that I've had people from 100 countries visit my blog. How cool is that? I don't think I've ever seen a Christmas cactus - that one of yours is stunning. I wonder if we have them over here? They'd probably have to be called something else as our seasons are opposite. Gosh Travis and Dayle look so alike!! I really didn't need to see those chocolate sundaes you know ... I put on a little weight last week and am trying desperately to lose it by next. Being a good girl and all that !! Oh, I forgot to say how much I like your QA lace scarf. I love that pattern and have done a couple of scarves in Noro Taiyo. The yarn you used is gorgeous. I love the way that yarn turned out individual motifs on the Queen Anne's scarf! Just gorgeous! About 2 years ago, I saw the most amazing Christmas Cactus I had ever seen. It was a MONSTER!! When I asked the lady about it, she was guessing it was around 80-90 years old. Beautiful. Teresa, Dayle is looking healthy so that is great. I was thinking of making a Queen Anne Lace Scarf as a Christmas present for knitting group, I think you just gave me the incentive. The boys are adorable, Love the pictures of total happiness, ice cream will do that for you. Glad to hear that your hubby is still doing well! Nice to see those boys enjoying some mac and cheese. Classic comfort food! I have never heard of a Christmas cactus, but I'm not much of a gardener so it's not surprising. It's gorgeous. And so is your scarf! I see you are using the Chroma. I just love that stuff. Love it. That yarn is so much fun to work with isn't it. I did like 8 Q.A. Lace scarves for all the girls last Christmas. The are so sweet to whip up. So glad to see the kids around to make all boo-boo better in the house. By the way, I know all about the Ambien. Only try to take it on those emergency nights, like probably tonight. And early too. Hi Teresa! So glad Dayle is feeling better! Your scarf is beautiful!! Love the colors! Such fun with the grands. They do love their sweets, don't they? PS did you get my comment about the book Sacajawea? 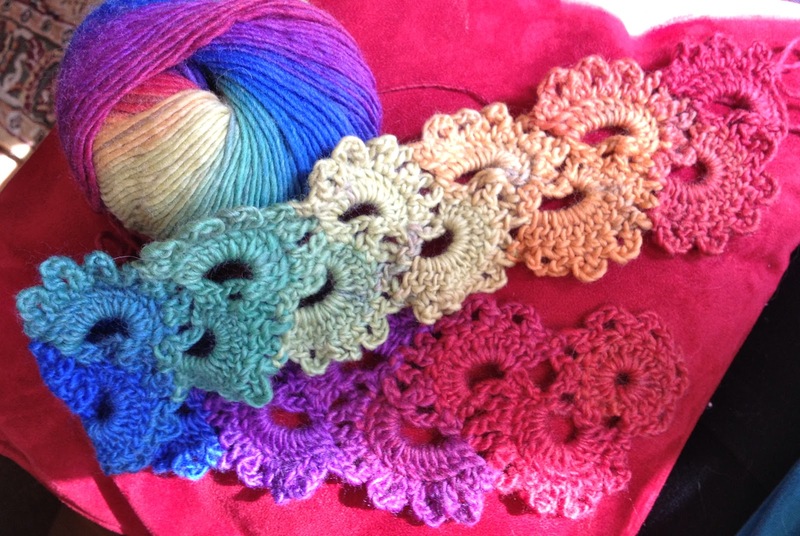 I made some Queen Anne Laces myself, however it looks great with the colour changing yarn. Beautiful. Your Queen Ann's is gorgeous. I love that yarn. I also love picture of happy little boys with ice cream and chocolate all over their faces. It just means happiness! Your Queen Anne's lace scarf is so pretty, I love the yarn in those amazing variegated shades. Thanks for sharing the pattern....when I've had more practice on my granny squares I'll have a try at it! So glad to see your hb looking so well, and the little boys having such a fun time. Enjoy your week, Teresa. My goodness those sundae's look so good! No wonder the boys looked so happy. I love the crochet scarf, really pretty. Hi Teresa lovely to see you all enjoying some family time - the sundaes look yummy. 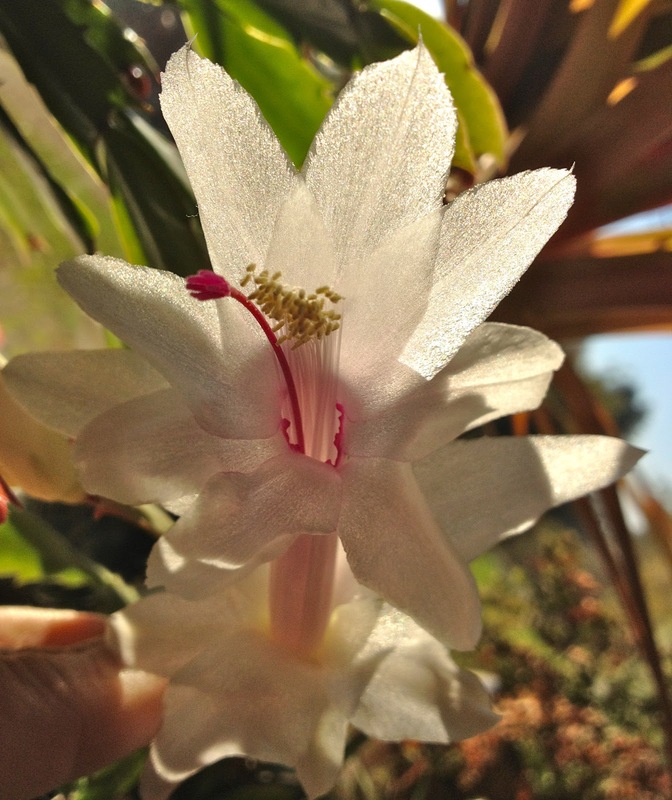 My Christmas cactus is a white one and looks similar to yours, it has just flowered for a second time this year. My sister gave it to me the Christmas before last and it obviously likes living here. Well now you've done it! I am in love with the Chroma yarn! It's gonna be that whole scene from Lord of the Rings again...you know, "precious, my precious..."
I love your cactus. My mother had a bright fuscia colored one when I was a girl. I love your scarf. I've been wanting to get some of that chroma. Oh, how I remember those simple days of getting a chocolate sundae and the pure delight it would give me. Very pretty scarf, Teresa. It reminds me of a victorian thread crochet lace bookmark pattern. I made many of them for a school fundraiser. Mmmm! Ice cream sundaes! Can't go wrong with that! Christmas Cacti is so pretty! I once had an Amarylis that I loved and it was quite hardy. That yarn worked up so beautifully in the Queen Annes lace pattern! What pretty colours. Hi Teresa. I think I made a wrong turn somewhere and I've ended up with a 6 petal flower which ends on the opposite end. Do I end the pattern there and begin with a fresh 6 chain loop on the other side as a connector? I'm afraid I haven't explained this well enough.Any advice, please?